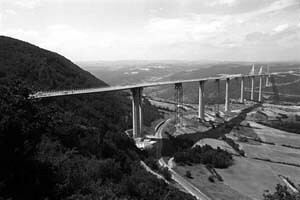 The Millau Viaduct is an incredible feat of engineering. The structure measures nearly 2460 metres long and was built with more than 36,000 tonnes of metal framework (which is five times the amount used on the Eiffel Tower). In addition to being extremely long, the bridge is extremely high (the tallest tower measures 343 metres - compared to the Eiffel Tower which comes in at 324 metres).